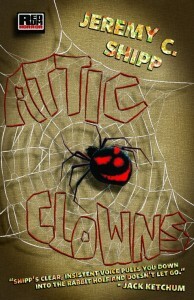 This weekend, I finished reading my first book of 2012 – Jeremy C Shipp‘s Attic Clowns: Horror Stories . As the name suggests, all 13 stories in this book contain clowns and attics but if you think that means you know what to expect, you’re wrong. I first encountered Jeremy as the instructor of an online writing course (which incidentally, I highly recommend). 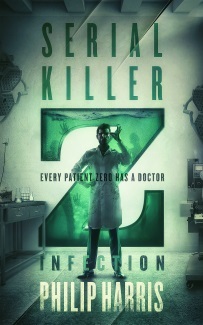 I’ve read several of his books and stories since then and quickly became a fan of his work. This collection showcases Jeremy’s warped imagination at its best. Inside these stories you’ll find a toenail clipping eating demon, men made of soap, astronauts, flying couches and a host of other, equally twisted, inventions – I particularly enjoyed Giggles, the story of a malevolent being trapped in an attic by the practical jokes of the woman who watches over him. I can’t for the life of me remember why my mother didn’t attend her funeral yesterday, so I ask her. Benny only thinks about one thing, so it’s no surprise when I find a miniature version of him curled up in my underwear drawer. Things could get depressing in here with that dead body decomposing in the corner. This is a deliciously creepy collection and it’s well worth your time, and not just because I got a call out from Jeremy in the acknowledgments. Oh, and you can also follow Jeremy’s own Attic Clown on Twitter.